Before going through the CPANEL backdoor to change your password, the first step would be to use the “forgot password” feature from your WP login page, but if you can’t remember the email it goes to there is another way to assign a new WordPress password from the cPanel of your hosting account. It’s not just as simple as adding a new password. 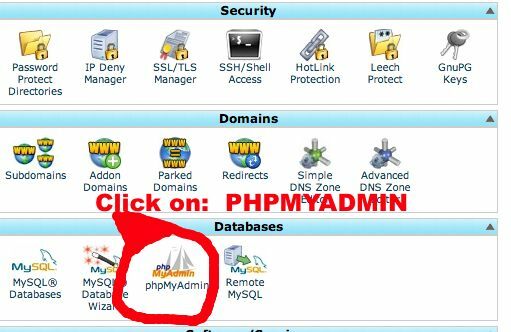 It requires you logging in to CPANEL to access PHPMyAdmin. If for any reason you would like to change your WordPress password or you have been locked out of your site, here is how you can change the Password from your Hosting cPanel using the MD5 Encryption. Login to your cpanel http://yourdomain.com/cpanel or yourdomain.com:2083. In the list of controls look for the DATABASES section. Click on PHPMYADMIN. Next CLICK ON YOUR WORDPRESS Database name. Then click into the wp-users database. In you hosting account, your Password is encrypted for security reasons using MD5 and will look something like ‘bf1f45c793581b5836c73c82c6186ee5′ and you will need to know how to create a new password using MD5 encryption. Click GO and then your new password is fully encrypted and saved. Open a new window or tab, and go to your wp-admin to login. Use the brand new password you just saved. It is a good safety practice to keep a copy of your username and password in a file only you control. When you need to login, if you forget your password, view the note and then just copy/paste if its on something like a notepad or text editor or type it in if you have it written on paper. A great tool to use to avoid losing your user login, is LAST PASS. Google LAST PASS. It will keep all of your passwords safe and help fill in the field when you go to login. I hope this lesson on changing your password helped you. Need more help? Call 214 736 4093. Help is on the line.